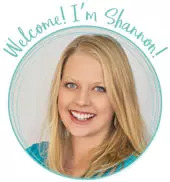 by Shannon Clark in Family Budget | 31 comments | Contains affiliate links. Learn how to budget with Mint effectively using this step-by-step tutorial. Budgeting with Mint and sticking to it is easy! Let’s get started! 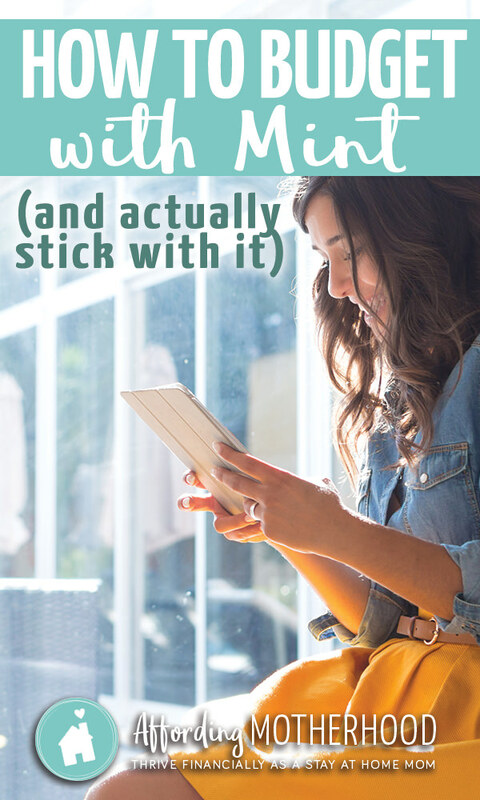 Today I’m sharing another one of the simple shifts that transformed my ability to finally stick to a budget and get out of debt fast. I’ve previously shared that I use Mint.com to track my expenses for free. Today I’m showing you exactly how to use Mint effectively to manage my zero sum budget. Mint is not perfect for this purpose, but it is free, as opposed to some of the other options out there. When we were laser focused on getting out of debt, there was no way I was going to drop $60 on YNAB or even more for other budgeting software! Instead, I figured out a way to hack Mint so I could use it for a zero sum budget. I’ll be honest, it wasn’t easy. The good news is, now that I have it figured out, I’m going to share what I learned with you and hopefully save you the pain of doing it yourself! First off you might be wondering, what is a zero sum budget, anyway? And how does it help you stay on budget? Well, you’re probably familiar with the concept of budgeting: You go through each of your budget categories and assign an amount you plan to spend in each. Here’s a subtle difference that took us from years of budgeting attempts and failures into fast budget success! I used to think that if I set aside a buffer in our budget, there’d be enough left over in case we went over in any given category. It just gave us license to go over in many budget categories, every month! Instead, I learned the simple but amazingly effective technique of Zero Sum Budgeting. You don’t necessarily need to spend each dollar, it could go to savings or retirement, but you still have to give each dollar a job. If you were to total up each of your budget categories, they should equal exactly your expected income for the month. 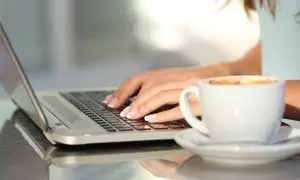 This technique also makes sure that you plan ahead to use any “extra” funds to go toward something really important like getting out of debt. I know it can be tough to find any extra in a really tight budget, but small surpluses do come our way occasionally (bonuses, raises, tax returns, etc). If you’re not prepared with a clear budgeting plan, those will quickly disappear. Why use Mint.com for Zero Sum Budgeting? Mint.com is wonderful for a few reasons. First and foremost, it is free. When you are on a tight budget and trying to get out of debt, this pretty much trumps all. Mint is also satisfactorily secure. 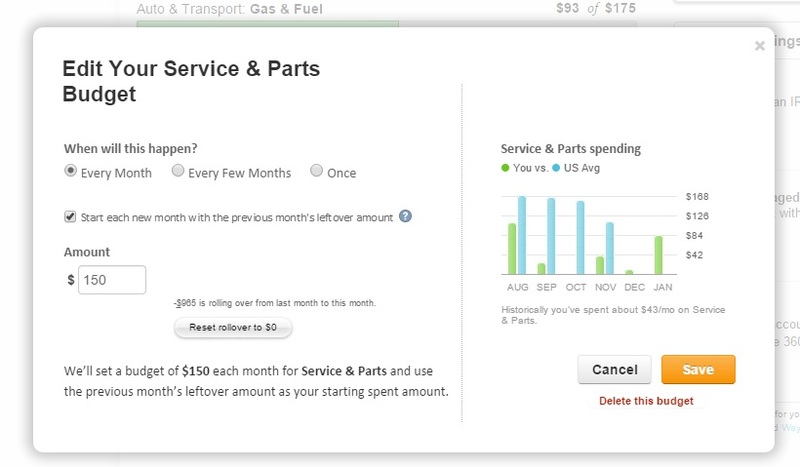 It automates the process of tracking your expenses, so you’re more likely to stick with it. Mint also has a free app, so you can check your budget on the go before you decide to make a purchase. Mint has pretty graphics, so you can see how close you are to meeting or exceeding your budget categories. Basically, Mint allows you to easily see how much you’ve been spending and how much you have available at any given time. This is key to sticking to a budget. After all, what’s the point of checking your budget once a month after you’ve already gone over it?! There is one thing at which Mint fails miserably, though. It is TERRIBLE if you want to do a Zero-Sum Budget. In other words, it’s miserable if you actually want to stick to that little budget you made or have any hope of getting out of debt. Ironically for budgeting software, Mint has no default budget categories for saving for emergencies, contributing to retirement, or saving for college. You can set goals, but these don’t integrate well into the overall budgeting feature. In my experience, Mint’s overly simplified income vs. spending calculations never seems to add up to my actual income and spending. Thus, seeing whether your budget and spending is a true “zero sum” is pretty much impossible with Mint alone. Despite these disadvantages, the fact remains that Mint is free. I learned to hack Mint.com to do a zero sum budget, and today I’m going to share exactly how I do it. Once you know a few simple Mint budget tips, it’s really easy to do a Zero-Sum Budget with this free app. Here’s how. 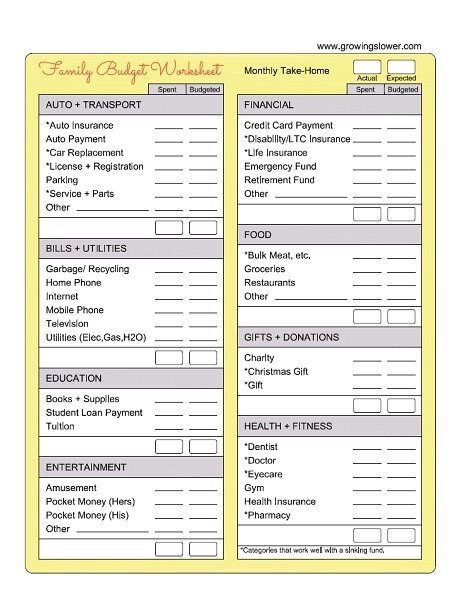 Make a list of your anticipated take-home pay for the month and all your budget categories. List how much you plan to spend in each category. It really helps to write them down in the same order and with the same names that Mint uses. Click to download my free Family Budget Worksheet printable where I’ve already done that for you. It’s custom designed make it easy to do a zero sum budget with Mint.com. This is a really valuable exercise in its own right. It’s a lot harder to ignore the budget staring back at you from the front of the refrigerator than it is yet another notification on your phone. Remember, the total of your expenses (including savings) should equal your income. Enter your budget for each personal budget category into Mint, so it will automatically track your spending throughout the month. For expenses that you don’t pay monthly, like buying new tires or back to school supplies, you’ll want to save a bit each month. That way you’ll have enough when it comes time to pay for this expense. This concept is called a “sinking fund.” You can use the Mint rollover budget to track these sinking funds. To create a budget for a category that needs a sinking fund in Mint, select the “Every Month” option and make sure to check the box for “start each new month with previous month’s leftover amount“. Here’s a screenshot, so you can see what I mean. You can see that for this sinking fund we are rolling over $965 from last month and we’ll be adding $150 this month. When we have to pay for unexpected car maintenance we won’t be draining our emergency fund. Mint will automatically categorize your expenses for you, but you should double check that it is putting everything where it belongs. Over time Mint will learn in which category each of your regular expenditures belongs. As you assign categories for each transaction, you can choose to check the box “Always rename [Default Transaction Name] as [Desired Transaction Name] and categorize as [Desired Category]” to create a new rule. To edit the way Mint categorizes your transactions, click “Transactions,” and select “Manage Your Budget Rules” link at the very bottom of the page. You can also create rules to help the process along. You can also create rules to help the process along. There are some expenditures that you may need to split into different categories. For instance, if you shop at Costco, Target, or Walmart, you might buy bananas (groceries), shampoo (toiletries), and a pillow (furnishings) in the same trip. For instance, if you shop at Costco, Target, or Walmart, you might buy bananas (groceries), shampoo (toiletries), and a pillow (furnishings) in the same trip. Mint makes this easy. Select any transaction, click “Edit Details,” and select the icon with a double arrow. 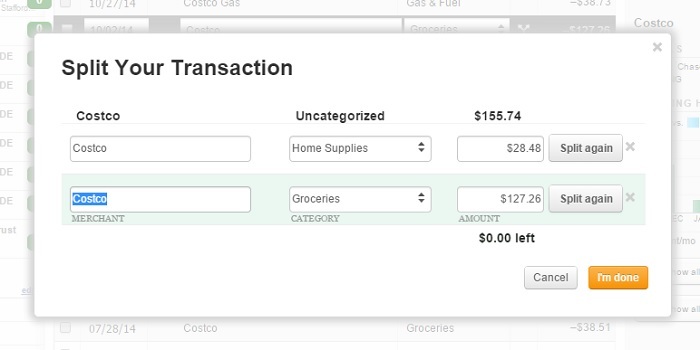 This will take you to the Split Your Transaction screen below where you can assign an amount and category. I try to do this as soon as possible, so I don’t forget what I bought or give myself a chance to lose the receipt. Make sure to check your expenses at least weekly. It’s easy and almost fun to check over a week’s worth of expenses. However, trying to sort through a full month’s worth of expenses and figure out what you bought on each trip to the store after the fact is kind of like a crime scene investigation. Messy, and no fun for anyone! What you dread, you will probably avoid. And that is not a good way to stick to a budget. Honestly, this is a habit that I am still building. Sometimes I stick with it, others not so much. At the end of the month, use the actual spending totals from Mint and write them down next to your budgeted expenses on your paper budget. Add up the total and enter it at the bottom. You’ll also want to write down your actual income. How did you do? Did the total of all your budget categories exactly equal your income for the month? If you consistently go over in one category, is it time to readjust this to a more realistic goal? Was there an unanticipated surplus this month that needs to be sent to an extra loan payment or your savings account? For the longest time, I thought a budget was something you did once or maybe even once a year. I soon discovered that was not a good idea if I actually wanted to stick to my budget! I now highly recommend writing out a new budget each and every month. Our lives can change not only in big ways like having a new baby or moving but also in small ones. Each month has its own expenses that you might not have anticipated. These must find a home in your budget for the month if you plan to stick to it. It doesn’t take long because, of course, most categories will be very similar from month to month. In fact, print out 12 budget worksheets right now, so you can skip that step when the next month rolls around. To sum it all up here are the simple tips for how to use Mint budget app so you can stick to a budget, at last! Hack Mint.com free budgeting software to do a Zero-Sum Budget. Check your spending at least weekly. After all, what’s the point of checking your budget after you’ve already overspent? Check your budget at the end of every month and make changes if needed. Make a new budget every month to plan for family and seasonal changes. What simple tricks help you stick to a budget? Share your tips in the comments! Where can I send your free Family Budget Worksheet printable? We are really working on our budget this year to pay of student loans, so thank you! We are officially budgeting for the first time this year, and loving your budget course! I’d never even heard of a zero sum budget until this post, so thanks for spelling it out for us. We’ve been using Mint for the past few years, so thankfully we have a good amount of data to help us really analyze our spending and start making adjustments. Thanks so much, Shannon! Excellent post! Zero sum budgeting has saved us probably thousands of dollars in the couple years we’ve been doing it, and I spread the word every chance I get. This is a great hack, and I love that it’s free with mint.com! I will add, though, that if you are like me and will probably not sit down every month to write out a new budget, the $60 investment for the zero sum budgeting software YNAB is worth it. Not only do they make it easy to do, but they have excellent customer support and will even help you with your budget and give you feedback. Just sayin’. I’d thought I was pretty good at budgeting before I met the zero sum budget…do whatever it takes to implement it in your life! You definitely have a great point! This method definitely takes more time than with a software that’s tailored to zero sum budgeting. Now that I have a little more wigggle room in my budget, I’ve tried quite a few other options. My favorite is Quicken or Quickbooks. They’re actually made by the same company as Mint, but work a lot better for zero sum budgeting. Great post. Just recently found this site – you provide a lot of great information. YNAB (You Need A Budget) is a great alternative to Mint and well worth the cost to save time and frustration. Can also add, delete, and edit categories and subcategories, which is really nice. Anyways, great post – thanks for sharing! How does it work better for zero-sum budgeting? does quicken fully support it? Thanks for the tutorial! I had shifted away from Mint to a spreadsheet because I couldn’t find a way to make Mint work with my budgeting style but this tutorial fixes that. I also enjoyed you post on tracking sinking funds on Mint- any thoughts on how to track one without starting at zero? I’ve been tracking my sinking funds on a spreadsheet, but would like to start tracking them on Mint. Thanks! Yes! I have to say I’m so thankful this made since and that you were able to use it! I know I can be super fussy about my budget and probably over-complicate things. :) Anyway, yes, you can start you sinking fund on mint at any number. Simply set your budget for the first month to the number you will have in that sinking fund at the end of the first month. Then the next month, you can switch it back to your regular monthly contribution to that sinking fund. Let me know if that makes sense! Thanks! That makes perfect sense- I’m gonna try it out today! I have avoided using Mint for this very same reason and have been budgeting in paper for years. I have tried Mint, and like it, other than the fact I couldn’t figure out how to make my budget categories that had amounts in them already (such as car maintenance, etc. ), what I believe you call a sinking fund, start at an amount and not just 0. I will try this and see if I can figure it out. Ah yes, Amanda, I had the same problem with sinking funds that didn’t start at zero. I just keep a spreadsheet of amounts of my sinking funds and update it each month. Not perfect, but it works well enough. :) The only software I know of that does it automatically is Every Dollar by Dave Ramsey, but I found it really frustrating to use over all. How does this work exactly. Say I set a category to $10 and to carry over last months balance each month . If I don’t spend $10, I’ll have $20 the next month, right ? Btw , I subscribe to YNAB online ( or nYnab) but I like how mint automatically updates transactions, is faster , More reliable , has goals , has trends, and it’s free! It’s learning feature is also nice . The only reason I’d move to it is to save time over YNAB . Yep I love the Mint budget for all those reasons! And to answer your question, you’ve got it exactly. If you don’t spend the $10, next month you have $20. This is a sinking fund, perfect for non-monthly expenses that tend to pop up like new tires, school supplies, Christmas presents, etc. Save a little each month and you’ll have the money you need when those things come due. I’m trying to click on the free budget plan printout and it’s not working, in every place it’s hyperlinked. What gives? Thanks! Love this writeup though. Thank you for writing this! We have been using mint for a while, not to its full potential. But, I have all my accounts linked to it lol. I am trying to figure out this budget thing and appreciate you creating a sheet that mimics what mint.com has. I can’t get the link to work to be able to print it out though. I just found your blog on pinterest and plan on look at a bunch of your other money saving posts! Hi, loved many parts of this article, however could you offer more precise tips? Mint is exceptionally challenging to use a zero-sum budget with, and I would love to read more or hear more from you directly about what exactly you do every month and the processes you use to make this work. The tips you provided were excellent, but have you run into issues you can share and how you resolved them? I am coming from YNAB but I’m going to give Mint another try, especially since it support a sinking fund. Can it show you the amount of money that you haven’t allocated to a budget category yet? Or do you have to keep track of that yourself? I have a pretty busy lifestyle so keeping a paper budget alongside an electronic budget won’t work, I won’t update them both which will lead to failure. So, either Mint does it all or I’ll only use it to check balances and long term savings goals. Hi there! I know it can be time-consuming to do both Mint and a paper budget. Since you know this probably won’t work for you, then I would recommend trying a different budgeting software. If it’s in your budget, my favorite option would be Quicken (by the same company as Mint, but more bells and whistles. I have also heard great things about YNAB. I have been using mint for awhile. I figured out how to export at the end of the month so I can put it into my excel file for budgeting. What I am having a hard time with it that mint records the transaction when it clears your bank. I like to record my transactions the day they happen. Doesn’t really affect the budget until the end/beginning of the month. Any suggestions on that? I believe you can change the date on your Mint transactions. If you’re manually entering each transaction, then you might like the free version of Every Dollar. I just wanted to give you something to look into that has worked flawlessly for me for years. It’s an app called pocket money 2. I paid $5 for it but it is easier to manipulate than mint. It’s not connected to your bank for transactions but you can set up recurring transactions and categories. I use the freee every dollar to decide how to allocate our non-recurring monthly bills and how to spend our sinking funds on a fixed income. Then I set them up in pocket Money and every month they repeat and I post them. They deduct from my available balance which has to reconcile with my banks cleared balance. As each transaction clears I mark if in pocket Money. I’m a numbers gal too and the reports this app offers are limitless. This is coming from someone that used quicken for years. I don’t need it anymore. I was turned on to it by reading reviews that compared it to mint and ynab so I tried it out and sure enough it far exceeded my expectations. Thanks for sharing this Kristi! I look forward to checking out the Pocket Money app. Love this post!! I have my checking account and the monthly amounts I pay towards my credit cards. Is there a way to see how my payments are actually affecting my credit card totals? Yes, Mint has a very nice account overview, so you can see your total assets, liabilities (debt), and your net. It updates automatically, so it’s always up to date.